Ingredients: Sodium Bicarbonate, Citric Acid, Perfume, Lily Head Infusion (Lilium candidum) , Jasmine Absolute (Jasminum officinale) , Ylang Ylang Oil (Cananga odorata) , Neroli Oil. .
Review: This is a ballistic made for forum members only for one day, in the “Lily Savon”soap or “Ghost” Lush scent. Plain and simple, it’s lovely. It’s heaven on a stick. I love all the Lily Savon family of products, Ghost shower gel, Lily perfume and this ballistic. I use all of these alot lately. 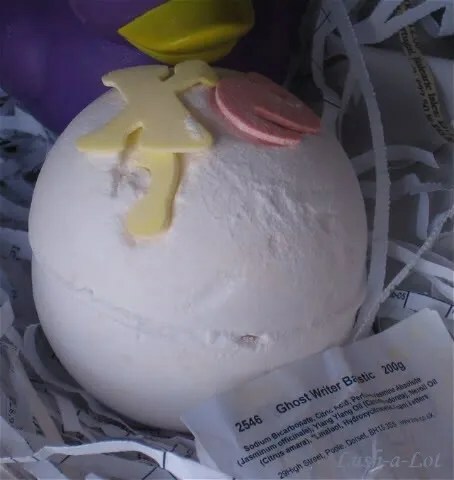 Posted on August 23, 2015 by Lushalot	• This entry was posted in Bath Bombs, Halloween Past and tagged forum member only, ghost scent family, halloween, jasmine, lily, lily savon soap scent family, ylang ylang. Bookmark the permalink.